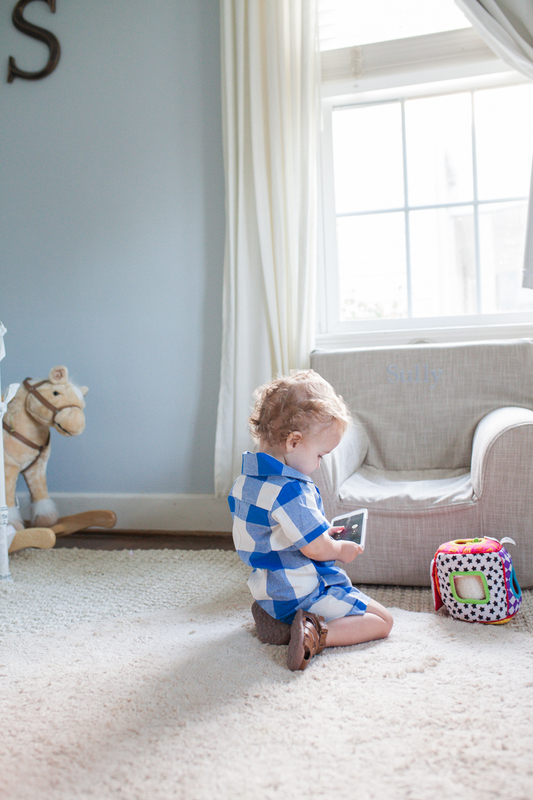 How cute is Sully in his blue plaid outfit from Carter’s + his little brown shoes are the sweetest! 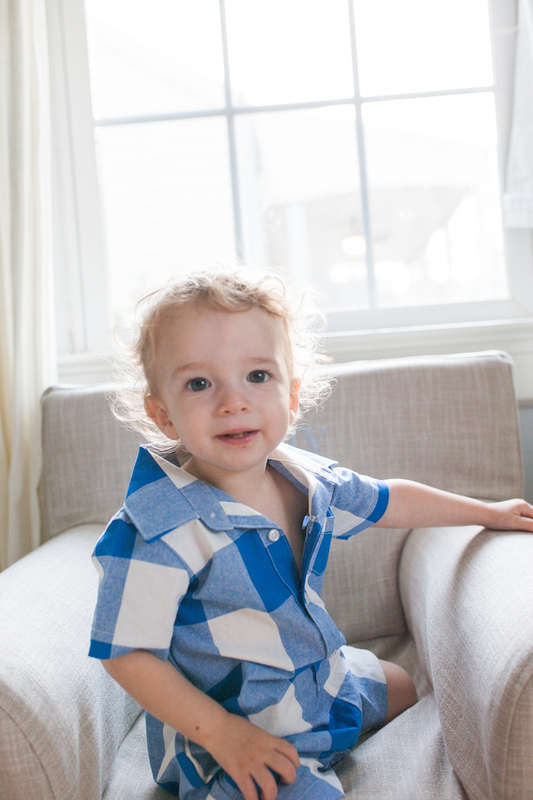 Love his 2 piece crab pajama set for spring! You’ve seen from my Instagram that my family and I travel a lot. When you don’t live in the same state as your family, but are a do-able drive away, traveling becomes second nature, at least it has for us. We are just 5 hours away from our family, which is a fairly easy drive. We’ve done trips home as a whole family and I have done this trip solo with just the kids and I. That is the topic I want to talk to y’all about today. I’ve had my share of good and bad experiences and I’d love to share a few things on how to get through a trip solo if you it’s just you and your kids. Pack Wisely: My goal when traveling is to have as much stuff at my designation beforehand (like food, bedding, kids gear, etc) so that the amount of stuff I’m hauling into the car is minimal. If you are visiting family and staying at a house, that is of course easier. As far as clothing goes, pack as light as possible. For the kids I try to pack clothing that isn’t bulky, shoes that can apply to several outfits, and pajamas that can be mixed and matched (syrup on the pajama shirt? no worries, we’ll pair it with the other pj top so no washing is involved!). 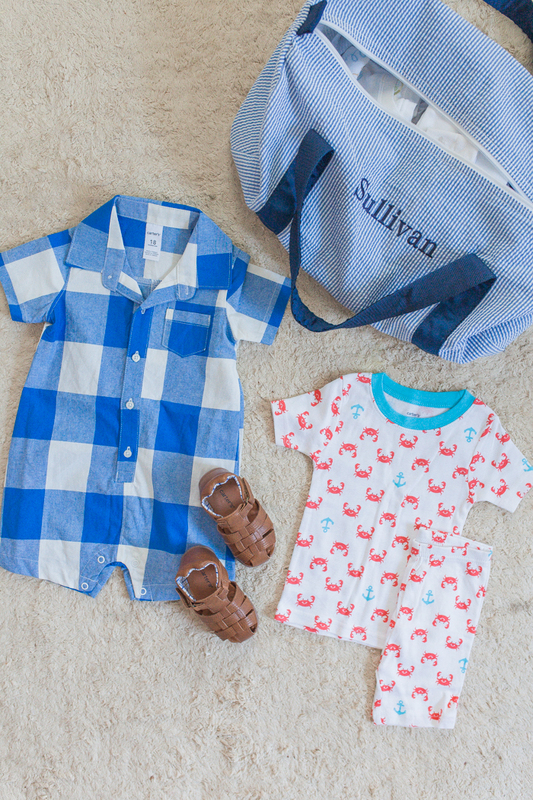 We’ve been packing Carter’s pjs for several years and they are our favorite and are so easy to slip on and off (especially the two piece crab set above)! 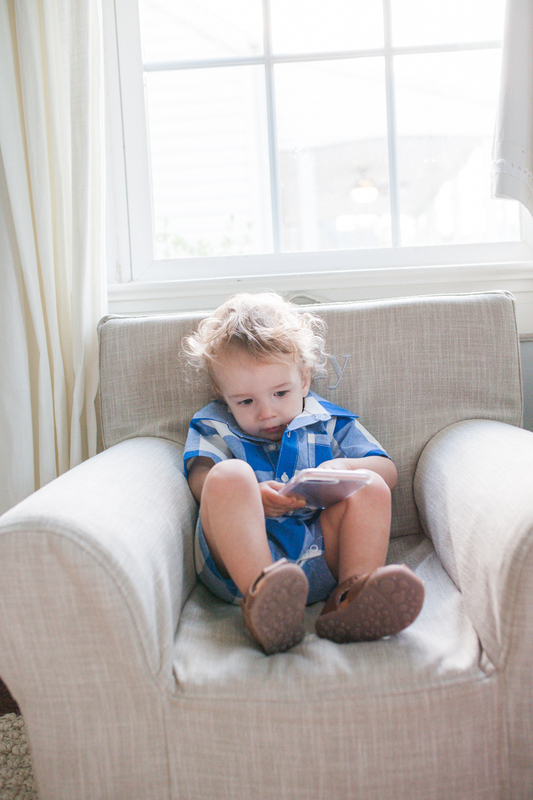 I love the shoes from Carter’s for spring this year (as pictured above of Sully’s little brown sandals) that are great for casual playtime and perfect to pair with Sundays best- so that the amount of shoes I am bringing is minimal. Unless we are going on a special outing or have an event to attend, I pack play clothes that are comfy for play and time in the car. I used to pack really impractical things for the kids, but after years of doing this I’ve found that packing for 1 outfit a day for each child plus 2 extra outfits is all I really need. I used to pack 2 outfits a day for Sully and I wouldn’t even touch half of what I packed. You live and learn. Minimal is best and you will survive on what you brought! Prep The Car: Run through one of those $5 wash places and do yourself a favor and get a quick vacuum to get rid of most of the debris. I’m telling you, nothing is more chaotic then trying to find cup holder space when there is junk everywhere from the last 6 months that you haven’t tended to while trying to drive. Check all car seats for adjustments, add car seat liners, swap out car toys for new toys, get a new stash of wipes, roll of paper towels, phone car charger, and a few grocery bags for trash. Oh, and don’t forget to fill that tank up before your trip starts! Strategize Your Stops: For instance, I know that when I leave my house no matter what time it is, there is a Chick Fil A 2.5 hours away. That is my safe spot. I can get out of the car with both kids, eat, use restrooms, and have a place to let them run around for a bit. If I can make it 2.5 hours to that CFA (which usually I can) then I know I am golden. If I have to stop again for toddler potty breaks or diaper changes then I know I can get by with stopping at a nicer(ish) gas station stop really quick. PS- I always have my portable potty in the back of my car for Scarlett to use. That way we never have to leave the comfort of our own car if there are no good places to stop. 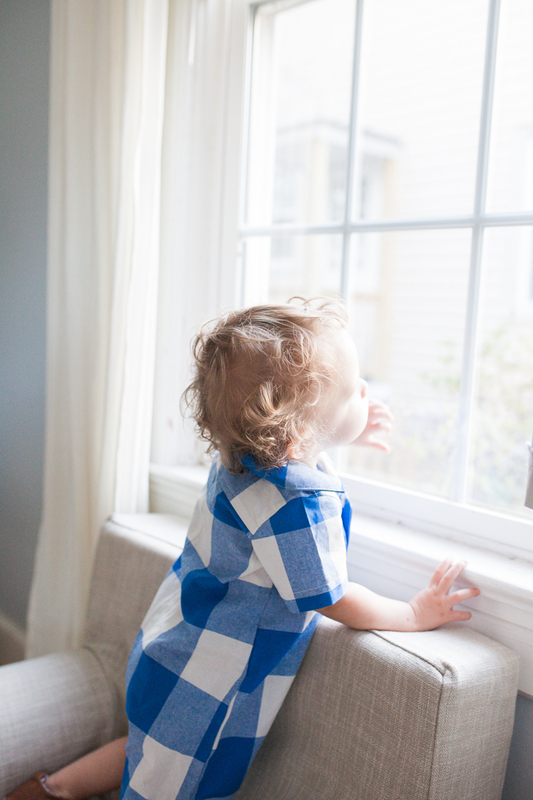 I’ve learned from experience that it’s best to plan for one long 30-45 minute stop for this type of shorter travel just to alott for diaper changes, potty breaks, snack breaks, sanity breaks, and leg stretches. Don’t try to go all the way with no stops, I’ve done that before and really regretted that. Chaos hit an hour before we got there and it was the hardest hour. Snack Prep: Pack good snacks that aren’t messy and don’t require hand wipes immediately for the kids. Do not pass back a food pouch, been there done that and it required a random stop for clean up. Some favorites for older toddlers are gold fish, cheerios, cliff bars, dry fruit, and a “treat” type of snack like a cookie. <– This rewards good behavior, enables successful bribery, and gets you through the last 30 minutes (because why are those always the moments that hell breaks loose?) Some good snacks for older infants and young toddlers are puffs, raisins, and other foods that are dissolvable. Since I am not directly in the back seat with them, I try not to give hard snacks that pose a choking hazard. Just gives me some peace of mind since they are holding their own snack cup. Snack prep for mom is easy access food with a re seal on the packaging. I love those thin pretzels, almonds, something sweet, and a water bottle with a straw! I hope these tips were helpful to those who have spring travels coming up, especially if you are traveling solo! I think these tips I shared definitely could apply to a solo and family trip. 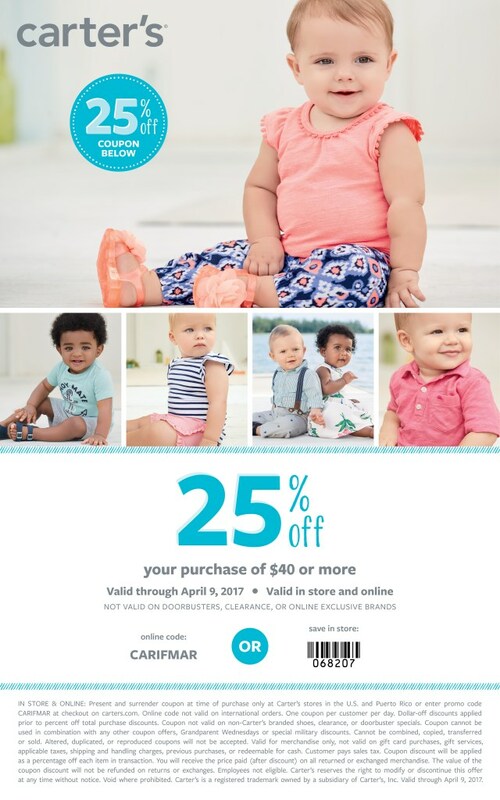 If you are searching for some new spring or Easter clothing for your kids, be sure to check Carter’s for some adorable apparel! 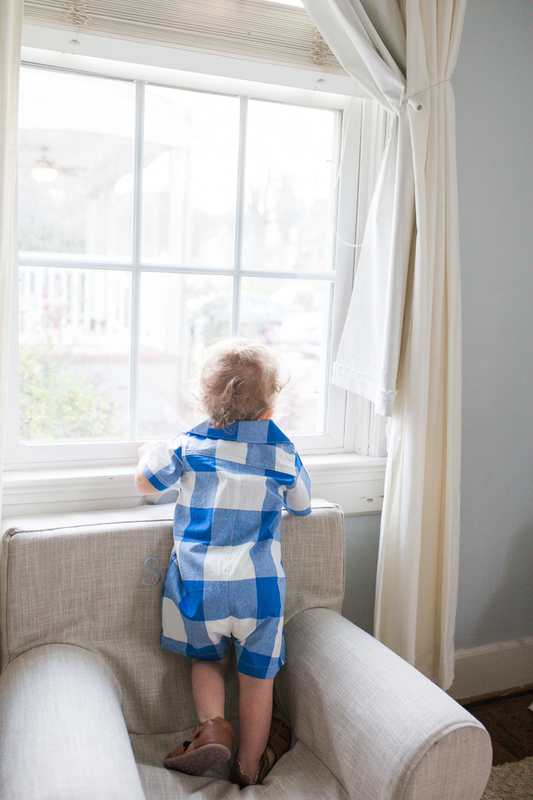 They are our go to for pajamas and swimsuits for the kids and I always love getting their trendy styles for spring! I love timeless pieces for my kids clothes, but can’t help scooping up some of the fun attire Carter’s has for the kids too! Sully looks so cute in his plaid outfit and Im loving the two piece crab pajama set! Be sure to use this promo code below for 25% off your purchase of $40 or more while doing your shopping! It’s the perfect time to stock up on spring styles before sizes and styles sell out!